Rose, I never saw such beautiful (wow) quilting as this. All the blocks are just spectacular!!!! Thank you Kerry for sharing these photos. You have a great machine quilter but I am sure your beautiful appliqué is inspiring. Oh my! The quilting complements your applique work so well. There are no words to express how beautiful this is…takes your breath away! All that beautiful applique and all one can see now is the over abundance of quilting. I like quilting and she has amazing designs but sorry ,for me, way too much. What a beautiful finish to a spectacular quilt!!!! I hope you are going to show this one! Kerry, here’s another quilt for MQX New England!! I honestly think you and Rose should enter your collaberations. The quilting is stunning – love those humming birds! Wowie! You quilt is spectacular and the quilting just adds to it. I love that she quilted butterflies and hummingbirds; they really enhance your desgins. What a showstopper this is! AGAIN 2 great talents together! wonderful work and inspiring talent! 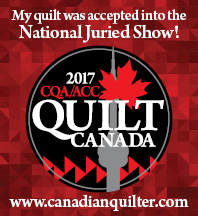 I was lucky enough to see your other quilt in person at the Simcoe County show a couple of weeks ago! I love it. The appliqué really looks like it’s three dimensional, with the dense background quilting. The hummingbirds in the center are wonderful, and for some reason, the circles in the middle of the sunflower just delight me!